Jammu, Mar 25: Art of living Jammu organized certificate distribution ceremony for PMKVY RPL Yoga Trainer program at NITS Polytechnic, Indira Nagar, Miran Sahib, and Jammu Today wherein 76 successful candidates belonging to various walks of life were given the certificates. Savinder Gupta, Chairman NITS Polytechnic, Dr. Naresh Chopra, Mr. BR Gupta, Mr. Mahaveer Gupta and Mr. VK Soni were the guests of Honour. 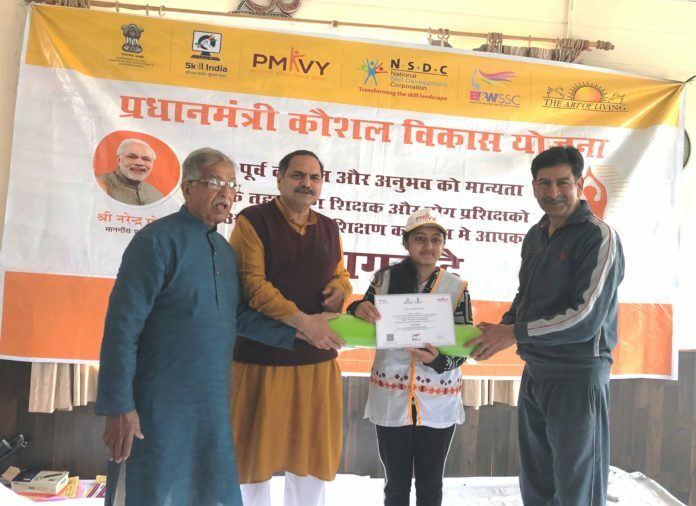 Anirudh Gupta, Coordinator SSRDP J&K while welcoming the guest said Pradhan Mantri Kaushal Vikas Yojana (PMKVY) is the flagship scheme of the Ministry of Skill Development & Entrepreneurship (MSDE). Individuals with prior learning experience or skills are assessed and certified under the Recognition of Prior Learning (RPL) component of the Scheme. RPL Yoga is a platform to provide recognition to the informal learning or learning through practice of Yoga to get equal acceptance as the formal levels of Yoga education. It provides an opportunity to receive certification from NSDC, MSDE. In the experience sharing session the participants said that they were highly impressed and greatly benefited by the orientation conducted by SSRDP, Art of Living faculty and the excellent arrangements made for the conduct of this program by AOL. Savinder Gupta, while addressing the participants congratulated them on becoming Govt. of India certified Yoga Trainers and also praised the effort of the J&K AOL for arranging such a wonderful program for the yoga enthusiasts of J&K. He further emphasised that these Govt. certified yoga trainers will spread a wave of well being through yoga which will greatly benefit the state of J&K. Dr. Naresh Chopra, BR Gupta, Mahaveer Gupta and VK Soni, Guests of honour lauded the efforts of J&K AOL SSRDP and expressed their keen desire that AOL SSRDP should take more such initiatives and assured the organizers for their full support and cooperation in all such endeavors. This was followed by vote of thanks. Previous articleChina welcomes goodwill message exchange between Modi and Khan on Pak National Day. Next articleCong more dangerous than BJP: Akbar.